Qilloway is a energetic brand and focus on product development. Combinated of traditional exquisite workmanship and stylish designed by famous designers in Los Angels , not only keep up with time but also lead latest fashion trends. Qilloway help you turn your indoor/ outdoor space into the favorite part of your home! ★ Handcraft product may have 0.4 in. variance,check your furniture before buying. ★ Color may change in different light. ★ Backrest is in vacuum packed , put it flat at least 72 hours after you open the package , pat it around , then the cushions will recover to normal shape. ★ The cushion core cannot be washed, can only wash the case of seat & backrest. ★ If you are not satisfied with products,please contact us freely.We would offer best service for you. Strict QC controlling of original material and process . Easy care: Sponge & Backrest hand wash with soap and water, squeeze out the water on the cushion , and then placed in a ventilated place , air dry ; Seat cushion with zipper ,the case can be machine wash by soft brush , air dry . 100% polyester fabric, UV-resistant, water repellent, durable, suitable for indoor and outdoor use. A variety of colors are available. Cushion is filled with 100% polyester fiberfill - environmental, recycle, clean and with good permeability. Overstuffed construction for excellent comfort and longevity, and the seat cushion is filled with a poly fiber wrapped foam and covered with a zipper closed. Sets includes seat(24 x 24 x 5 inches), and backrest (24 x 22 inches), easy to fit the chair. Hand-made cushion may have 0.4 inches variance, please note that the backrest will arrive in a compressed state, please allow several hours for product to expand to final size listed in description. Please check the size before you buy, thanks. 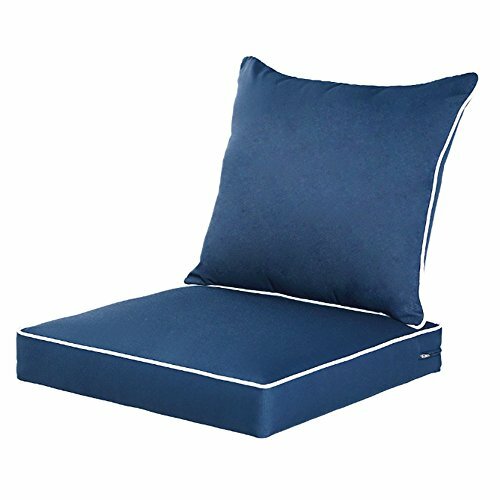 Design in right thickness - comfortable,well constructed, the cushion is covered with a non-slip mat keep outdoor cushion securely fastened to your outdoor patio furniture. If you have any questions about this product by Qilloway, contact us by completing and submitting the form below. If you are looking for a specif part number, please include it with your message.